With an exciting new format that includes graduated pages, whimsical art, and sturdy, shaped pages, STEPLets' are the perfect books for youngsters just stepping out into the world. Police cars and minivans, taxicabs and fire trucks--kids love all things that go! In this vroom-vroom board book they'll find a whole traffic jam-full of them barrelling down the road, from a putt-putting motor scooter to a clanging fire-engine - plus a hint of what's coming next! 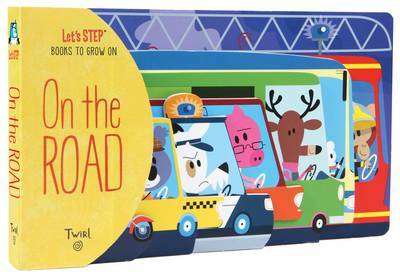 Is that a bus pulling out ahead of that truck?This smart mix of action-words, adjectives, fun pictures, and touchable pages offers learning-as-play for kids from toddler to preschooler to enjoy, and grow on.